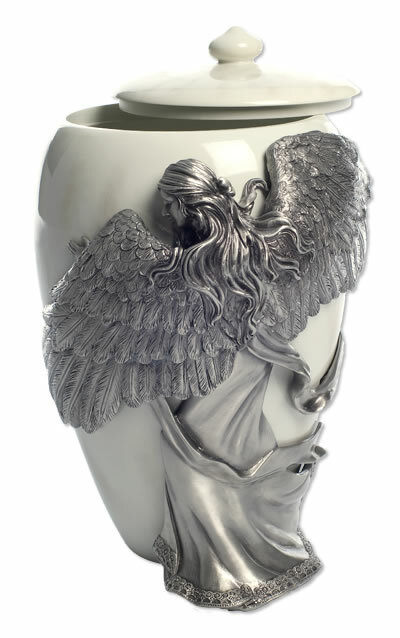 This Medium size Angel with Wings Urn is made of high quality cold cast polystone with a hand-painted marble finish and a beautifully detailed solid pewter angel wrapped around the urn. Remove the lid and the urn can be filled with ashes or with precious memories. The lid may be secured with glue (glue not included). This urn is large enough for small children with healthy weights less than 50 pounds, for pets weighing less than 30 pounds, or to use as a keepsake for families who are sharing the cremains of a loved one.